Flour is the main ingredient in all types of breads. Different types of flour milled from wheat are most commonly used for making bread. Hard wheat varieties have a high protein content meaning that the gluten forming capacity is also higher, which is especially suitable for bread making. Breads made primarily with non-wheat flours often include a portion of wheat flour to help the dough rise properly. In some parts of the world, non-wheat flours are more commonly used for bread making because the climate may not be suitable for growing wheat or a different grain has long been a favorite in a particular region. In Southeast Asia, for example, rice is a staple, while in Northern and Eastern Europe, rye is popular because it is better suited to the colder climate. As the name suggests, all-purpose flour is suitable for most purposes and is perhaps the most commonly used wheat flour for baking. It is produced from a combination of high protein bread flour and low protein cake flour, which provides just the right balance for most baked goods. All-purpose wheat flour is available in bleached and unbleached varieties. The chemicals used for bleaching affect the gluten strength of the flour; therefore bread makers often prefer unbleached flour. Bread flour is unbleached, high-gluten flour that typically contains 99.9 % hard wheat flour with malted barley added to increase the yeast activity, making it ideal for bread making. The use of bread flour results in larger bread loaves with a lighter and less crumbly texture. Bread flour is also referred to as unbleached flour. Gluten flour is produced from hard wheat that has been treated to remove the starch. It contains a greater percentage of gluten (at least 70% pure) than other types of flour and has nearly twice the strength of regular wheat flour. Gluten flour is most often used as an additive for various flours that are low in gluten or are gluten free, but it tends to toughen bread if used in excess. It is very useful for the preparation of pizza dough, bagels, and flat breads and rolls. It is often confused with bread flour, which is fortified with additional gluten, but has a lower gluten content than gluten flour. Graham flour is a type of wheat flour that is slightly coarser than regular flour. It is often confused with standard whole-wheat, but there are some differences. In Graham flour, coarsely ground flakes of bran are added and the wheat germ is usually removed to lengthen the shelf life of the flour. Self-rising flour is wheat flour in which the leavening agent has already been added. The leavening agent is generally in the form of baking powder. Salt is also commonly added to the mixture, so the sodium content is much higher than other types of flour. Self-rising flour should not be used in preparing yeast breads, but is very suitable for quick breads. It is also worth noting that the leavening agent in self-rising flour tends to lose its effectiveness the longer the flour is stored. Bromides added to flour help to ensure consistent results in baked goods. The bromated help to strengthen the flour to achieve optimum gluten formation for bread making. Bromated flour is rarely used in the United States because ascorbic acid is now used to strengthen wheat flour that is specifically used for bread making. Whole-wheat flour used for bread making is usually milled from red wheat and is produced from grinding the full wheat kernel, which includes the bran, germ, and the endosperm. Whole-wheat flour used alone in bread making results in a nutritious, but smaller and denser loaf due to the bran, which hinders the dough from rising fully. In order to create a bread loaf that is a bit lighter and of greater volume, it is often best to combine whole-wheat flour with all-purpose flour or bread flour. Semolina is a light yellow granular flour produced from durum wheat, which is the hardest wheat variety. It is high in protein and gluten, which are necessary components for bread making. Semolina flour is available coarsely ground or finely ground. The coarsely ground semolina is usually combined with all-purpose flour when making bread, but the finely ground semolina is often used alone. Bread made with semolina flour has a crispy crust and a chewy interior. Chapati flour is produced from whole wheat that has been ground to a very fine consistency. It is extremely popular in India and is used to prepare a number of Indian flat breads including chapatis and rotis. Tortilla flour is a type of wheat flour that is most often used for quick breads, such as muffins, biscuits, dumplings, chapatis, and tortillas. 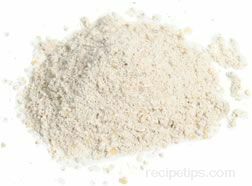 Amaranth flour is milled from the seeds obtained from the amaranth plant. Because of the lack of gluten, it must be added to other types of gluten flour when preparing yeast breads. It does not have to be added to other flours when preparing flat breads. Although barley flour does contain some gluten, it does not contain enough for dough to effectively rise, so gluten-rich flour, such as wheat flour, is often added to the barley flour when preparing yeast breads. Breads made only of barley flour are overly moist and the texture is similar to dense cake. Buckwheat flour is a variety of gluten-free flour obtained by grinding the seeds of the buckwheat plant. Because it contains no gluten, buckwheat flour must be added to wheat flour for use in yeast breads. Even when using a small quantity in yeast breads, buckwheat flour provides a distinctive flavor to the loaf. A flour-like substance that has larger granules than regular flour and is produced from grinding dried kernels of yellow or blue corn. Yellow or blue cornmeal can also be ground to a finer consistency and sold as gluten free flour that is used to make cornbread, muffins, pancakes, polenta, and tortillas. A variety of cornmeal made from dried or roasted blue corn. It is gluten free and it is often used to prepare a variety of flat breads served throughout Mexico. Atole flour is also known as blue atole flour. A variety of flour made from blue corn. It is also known as "blue corn flour" and when it is used for preparing tortillas, it is called "Harina Azul." A type of corn flour ground from dried hominy made from white or yellow corn. It is used in preparing corn tamales and tortillas. Blue corn is used to make harinilla and is not used for masa harina. Flax seed can be ground, packaged, and sold as flour. It must be combined with wheat flour for baking risen breads. Garbanzo bean flour (also known as chickpea flour) is a variety of flour that is most often used in East Indian and Middle Eastern cooking. Since it is gluten-free, it must be combined with another flour containing gluten (such as wheat) in order to produce risen breads. Kamut is a brand name for a grain that is closely related to durum wheat and is often ground, packaged, and sold as flour. Kamut flour contains gluten so it can be used to produce risen breads. Millet seeds can be ground into flour, but since it is gluten free, it must be combined with a gluten flour, such as wheat, when used in risen breads. It adds an exceptionally sweet flavor to baked goods. Oat flour adds texture and a rich nutlike flavor to breads and other baked goods. Since oat flour is low in gluten, it must be combined with wheat flour to produce leavened bread. Potato flour is made from cooked, dried, and ground potatoes and is often mixed with wheat flour for baking breads and rolls. Quinoa is flour is used for making breads, biscuits, muffins, pancakes, and tortillas. Since it contains no gluten, quinoa flour must be combined with wheat flour when baking risen breads. Standard rice flour is available in brown or white varieties. For most recipes, both types of rice flour may be used interchangeably. Because rice flour contains no gluten, it is not suitable for risen breads unless it is combined with wheat flour. The resulting loaf has a slightly sweet flavor and somewhat dry texture. Rye flour is among the most popular types of flour used in bread making in northern and eastern European countries where wheat does not grow well. The type of protein necessary for gluten formation is lower in rye than wheat, but it is higher than in most other grains. Rye flour is often combined with wheat flour when making risen breads. Sorghum flour lacks gluten so it isn't suitable for making yeast breads. In India, the flour is sometimes used for chapatis, which are a type of popular unleavened flat bread. Soy flour is a high protein flour ground from roasted soybeans. It is occasionally added to wheat flour when making bread to boost the nutritional level of some breads. It contains no gluten, so it cannot be used for risen breads unless it is combined with wheat flour. Spelt is an ancient cereal grain related to modern wheat. Although spelt flour lost favor in the United States when other high-yield forms of wheat were developed, it is still very popular in many European countries where it is used for whole grain bread recipes. Since spelt contains gluten, it is excellent for risen breads. In Ethiopia, where most of the teff is grown, teff flour is a staple food product. It is most often used for a thin, very sour flat bread called injera. Triticale is a high protein man-made grain produced by crossbreeding wheat and rye. The flour milled from triticale doesn't taste like rye, but it has a stronger, nuttier flavor than wheat. Triticale flour contains gluten, so it is a good choice for preparing risen breads. Gluten is the substance that gives dough its elasticity, strength, and makes the dough rise. Wheat has a high level of gluten. When bread is made with various types of non-gluten flour, wheat flour is often added so that the dough is able to rise effectively. Many types of flour milled from various grains, seeds, legumes, tubers, and nuts do not contain gluten. Breads and baked goods made solely with non-gluten flour have different characteristics than baked goods made with gluten flour. The texture is much more dense and crumbly because the dough made with gluten-free flour does not rise. Many people prefer the dense texture. Various types of baked goods made with gluten-free flour are also full of flavor and some have even better nutritional profiles than baked goods made with gluten flour. For various yeast breads, the quantity of barley flour that can be used is usually no more than 20% of the total quantity of flour used, however some bakers recommend no more than 5%. For denser, flatter breads, a higher proportion of barely flour is used. When making quick breads, barley flour can be substituted for about half of the total amount of flour required. About 20% of the total quantity of flour used for yeast breads may consist of buckwheat flour with the remainder consisting of wheat flour. Flour ground from dried legumes, such as chickpeas, beans, and peanuts can be used for bread making, but generally should not exceed 10% of the total quantity of flour used in the recipe - the remainder should consist of wheat flour for properly raised breads. Up to one-quarter of the total quantity of flour used for yeasted breads can consist of millet flour, which provides a sweet flavor to bread. Oat flour must be combined with wheat flour to produce leavened bread. For the best results, use 3 cups wheat flour for every 1 cup of oat flour. As much as 15% of the wheat flour used for yeasted breads can be substituted with potato flour. When making rye bread, no more than 25% of the total quantity of flour should consist of dark rye flour - the remainder should consist of wheat flour in order to create an adequately risen loaf. Medium rye flour may account for 33% of the total and 40% light rye flour may be used in conjunction with the wheat flour. It also helps to include some additional yeast. When rye flour is used alone it produces a very heavy, dense loaf (such as pumpernickel) and the dough is very sticky and difficult to handle. Compared with flour milled from other grains, rye flour contains more of the pentosan gums, which causes the stickiness in dough. Soy flour contains no gluten, so it cannot replace wheat flour entirely. It is best to substitute no more than 25% to 30% of the total volume of wheat flour with soy flour to ensure the best results when baking.